Apparently we're going to be stuck with low 20s for the next week. Awww, is that too hot or too cold for you, P'ter? Low 20s (C mind, not F!) is just about right for me. Too much over 27 C and I become woozy and don't feel like doing anything. Fine if you can just spend time under a parasol and enjoy the shade, but not if you have to go to work. You had the perfect day yesterday for the Royal Wedding and the FA cup final. We're officially in thunderstorm season in the southeastern US! 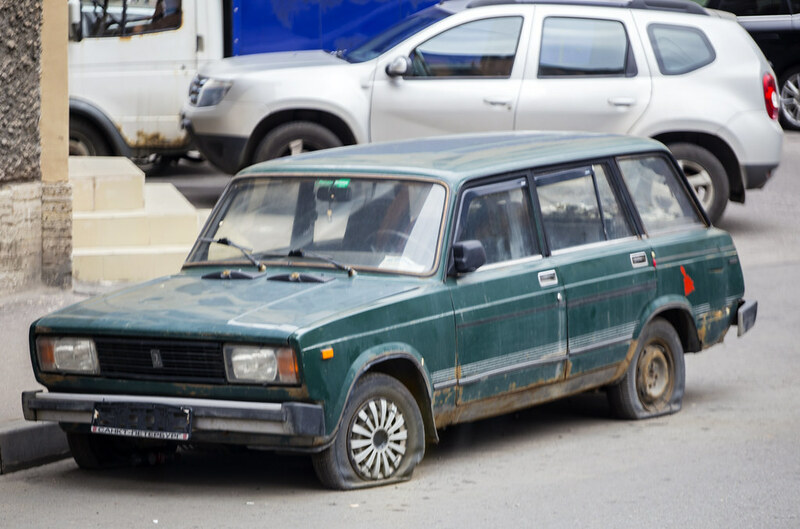 Right...finally got the Lada roadworthy again. We had...shall I call it...fun...getting the emission test passed. This turned out due initially to a dead ECU. This meant initially that I had no diagnostic system. Eventually I managed to track down a replacement ECU (they're basically made of unobtainium these days), which got me a working onboard diagnostic system. That showed a duff oxygen sensor. This was duly (if awkwardly) replaced. ...at which point it still persisted in showing code 13...no oxygen sensor signal. Wiring was checked, rechecked, the sensor was tested...all fine. I eventually tracked this down to being due to an actual design flaw in the ECU resulting in problems with any non original sensor (they've been extinct and unobtainable for about ten years now)...was actually really easy to sort once I worked out what was going on. All I needed to do was link too wires to correctly ground the sensing circuit. Suddenly the carbon monoxide content in the exhaust gases dropped from 5.247% (legal limit is 0.2%) down to a much more reasonable 0.047%. Not a bad result I reckon for a 25 year old bit of Russian pig iron. Should improve my fuel economy a fair bit too! Not much else been going on lately, reverse engineering a significant portion of the fuel injection system there had occupied the bulk of my brain cells for a fair while! Zelandeth, I know what you mean about working with old cars. I restored antique cars for about 15 years, so I know from first-hand experience that things are not always what one thinks they should be. I once did a lot of the restoration on a 1936 Cadillac. When it came time for wiring, as part of the engine bay work, I put all the wiring on the flathead V-8. Now understand that I thought that V-8 firing order, with the exception of Ford, was all the same. All General Motors brands and all Chrysler brands number their cylinders the same; one bank 1-3-5-7, the other 2-4-6-8. Ford did it different; 1-2-3-4 and 5-6-7-8. Firing order on non-Ford V-8s was all the same; 1-8-4-3-6-5-7-2. Well, I found out that is indeed true..... of overhead valve V-8s. Flatheads were quite a different story. That Caddy wouldn't run for diddly-squat. When I finally got my hands on a book (pre-internet days …. how did we ever survive?) I was able to correct things and by the time it was done, that big monster 4-door sedan would ghost along at 45 or 50 miles per hour (and up) so quietly and deceptively smooth you hardly knew the engine was running. I had to watch myself closely because more than twice I found myself doing that 40 or 45 MPH in a 25 or 30 MPH zone. Beautiful antique car or not, cops frown on such things and get rather upset about it. Especially when the license plate reads "PETRONE" and there's a realist-looking Tommy gun with a drum magazine in it laying on the back seat. The owner was a doctor. He also had a Ferrari. The license plate on it read "BASTA". Anyone need translations? "Basta" may not mean what you think, unless you speak Italian. Tomorrow I go in for surgery for colon cancer. "See" you all after. I hope your surgery went well, Allen. I wish you a speedy and complete recovery. It's either hot & humid or storming. We've had a couple of close tornados. Kibby fell down some stairs about a week after moving to Staunton and broke her wrist. It's all healed up now and as soon as the cast came off she got a job at McDonald's. She's working the grill which is what she wanted. Since she worked at McDonald's here she was started at a higher pay. Over all she is doing well. Not much going on in Concord. I've mostly been staying home taking care of Mom. Congrats to Kibby on the new job. Glad her wrist healed quickly. How's your mom doing? Kudos to you for taking care of her at home. I'm not sure I could do the same. Physically yes, but I'm not sure I could deal with it mentally, I'm not a carer personality at all. With my son, it came more or less naturally, but with a parent it would be different, even if I have a good relationship with both my parents and there aren't any unresolved issues from childhood, fortunately. Mostly with Mom I change her and make sure she has breakfast, coffee and dinner. I can't get her up. I have to wait until my sister is home to change her bedding. It's not too bad. Right now it is taking all 4 of us to pay bills, we can't afford to have her anywhere but home. She's doing well here. I was surprised McDonald's hired Kibby, since she quit the one here without notice. Kibby explained that they would change her position even tho they knew drive thru aggravated a pinched nerve in her shoulder. The day someone jurked her arm down hard. By the time she got home she could hardly mover her arm. The manger whete she's working now said she would have quit too. Since they changed my meds I haven't even been argue, much, with my sister or anyone living here. Now if we could convince Sam & Dean (large puppies) to quit eating everything that they can get hold of everything would be great. They have learned that cats have claws and don't like being picked up by their heads. Last edited by mawra; Jul 3 2018 at 12:59 PM. Luckily some managers are more sensible than others, I'm glad Kibby's current one seems reasonable and understood her reasons for quitting without notice. I think her former manager is lucky not to have been sued for knowingly taking the risk of aggravating a known medical condition (assuming Kibby showed the manager a doctor's certificate for it). Here, the employer would be liable for all medical costs following an accident on the job and paid sick leave. Doesn't matter if you work part or full time or have an indefinite or time-limited contract either. So here employers take health-related limits on work very seriously, not doing so could be expensive. A manager knowingly risking the health of their employees would risk getting fired themselves. Even if the regulations for firing someone are stricter here than in the US. Employers are suppose to pay medical bill and a percentage of your pay if hurt on the job and pass drug test. The problem this time is proving that work is what gave her a pinched nerve to begin with. The manager on duty is suppose to write it up and take the employee to get medical attention and make sure they are drug tested. When Kibby hurt her hand at a different job, that did not happen. Kibby worked 4 hours after hurting her hand, it was twice its normal size. The head manager was not happy when I called the next day to let them know she would not be at work, that she did not know she had been hurt and I took her to E.R. Normally I would not call in for her, but her pain meds were finally working and I wasn't going to wake her up. Ouch, she's been very unlucky with her hands and arms. So I'll put this where I thought I was putting it first-time around. For some reason, MoM's timing out on my computer before I get in. I don't know why, but it seems to be raining second-hand Anne McCaffrey books in Wellington right now. I was in two bookstores that had a whole shelf of them - so I put a hardback copy of "The White Dragon" on layby. Hope everything is OK, Haven't been able to get in for a few days. Must be a trend in Anne's books, a second hand store got in a bunch of boxes of books, selling them for 50 Cents each, Spotted a few of Anne's old paperbacks. A woman looking thru them told me she was looking for some Sci fi / Fantasy for her Granddaughter. I pointed to the Pern books and told her they would be perfect. I looked on my way out and they were gone, Hope she enjoys them. I've had problems getting as well. Good to hear things work again. I've had a fabulous four-week vacation with good or great weather, back to work tomorrow. I can't believe my little Kibby will be 23 in just a few days. Now she's all grown up. At least she thinks knows it all and has everything all figured out. Didn't we all at that age? I remember ten years ago when you posted about how amazed you were that she was a teenager. She still has all of them. And in a few years she will be wondering how you, got so smart so quickly. The way things are going right now, in ten years time those shopping bags will be museum pieces. Those that are not biodegradable. There's currently a fuss here because so-called "biodegradable" shopping bags only "biodegrade" into very small bits of plastic and so-called "compostable" shopping bags don't compost unless you have a massive commercial composting operation. I wonder what happens when people realise that the nylon bags that we're using instead don't biodegrade either. She got a bunch of clothe bags as well as plastic ones. I'm about ready to shoot or do something drastic to one of our dogs. It one thing when one doesn't come when called. It is different when one turns his head, looks at you and then ignores you. You know they heard you. So . . . you have a teen-age dog? Wot-effa! LOL, they listen about as well. Has it started collecting empty dog-food cans?